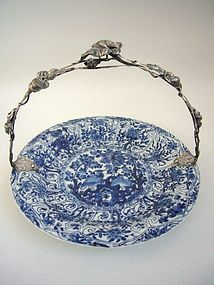 An export blue and white plate decorated with a bird and floral patterns. Kangxi period (1662-1722). Marked with an Artemisia leaf. Diameter 27 cm. The silver handle was added in 1854 by the wellknown Dutch silversmith J.M. van Kempen in Utrecht(later in Voorschoten). In the 19th century it was very fashionable in The Netherlands to add silver mounts, lids and handles to antique porcelain objects. Silvermarks: walking lion (silver grade 835), minerva head, maker's mark and year letter U for 1854. Condition: the plate has minor chips to the footrim, otherwise perfect, on the silver handle the top part of one of the leaves is missing.